This is probably going to be my last omakase at the UOB Standing Sushi Bar as they are opening a new branch at 8QSAM which is where they’ll handle the omakase dinners as the kitchen will be bigger. This is a pretty rare drink – black soybeans fermented with alcohol. It is like a very mild version of sake and you won’t really get drunk on this unless you consume like half a bottle. 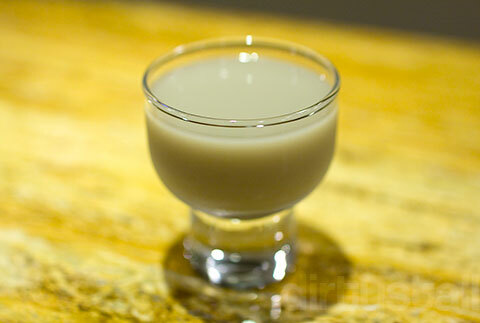 It tastes like soybean milk on first sip then the bite of the sake kicks in gently as you imbibe it down. 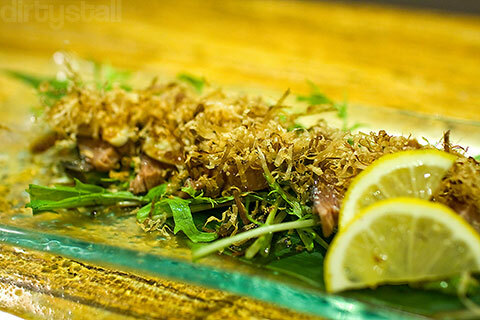 Katsuo tataki is a kind of sashimi where a block of raw bonito is quickly seared at high heat and placed into ice water to stop from cooking further. This creates a thin layer of grilled skin and meat on the outside. Very delicious as you can taste the grilled part giving some flavour to the raw meat, so there’s also a mix of textures between the cooked and raw parts. 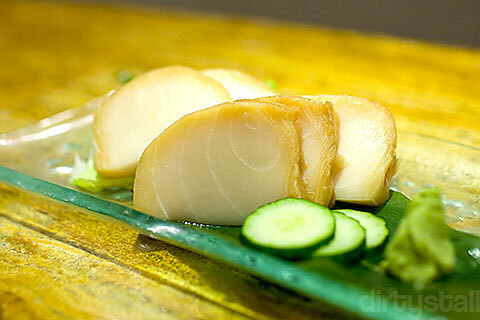 This sashimi is something quite rare in Singapore too. Shiro-maguro is known as white albacore tuna and this is actually the tuna that you see in those canned tins of tuna at the supermarket! But as sashimi, chef Roy marinated it for 5 hours in his secret blend of sauces before slicing it into thick chunks for me to try. My first impression was that it was like fishcake but as I ate more of it, I really became to love it. The texture is much smoother then a fishcake which is bouncy to the bite. 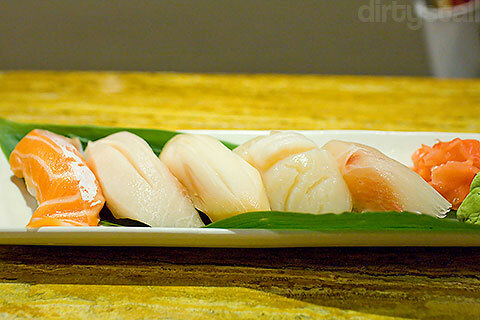 It also has some consistency to it, unlike the softness of salmon sashimi. 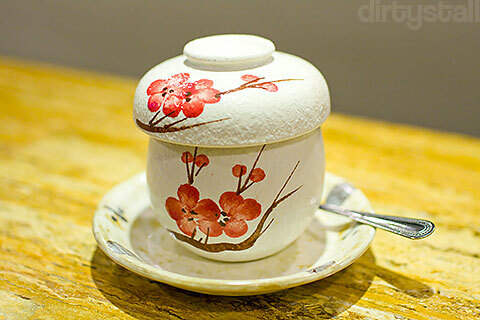 The taste is mostly imparted from the marination, a subtle salty taste, much like aged shoyu. 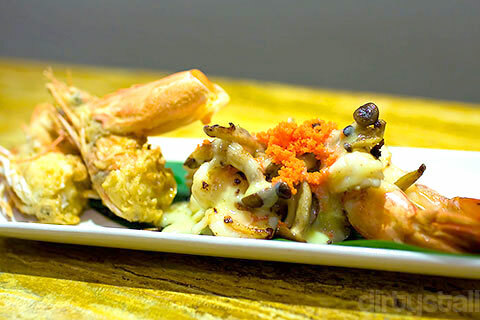 Basically grilled tiger prawns topped with mushrooms, fish roe and that delectable yuzu mayo sauce that Roy makes by himself. Heavenly combination to chow down on! Not to mention those deep fried prawn heads with the sinful brains inside! Surprisingly, this was the first time I had chawanmushi at the SSB! This particular one was topped off with a mass of glistening orange ikura pearls, while I discovered more mushrooms inside as I ate in. 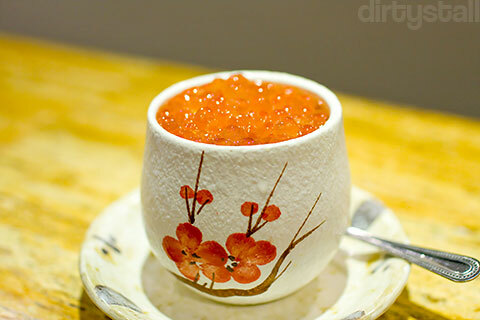 The egg was also speckled with yuzu shaving which moderated the saltiness of the ikura with a sour note. At first glance I thought this was kisu but chef Roy told me that it was actually aji! 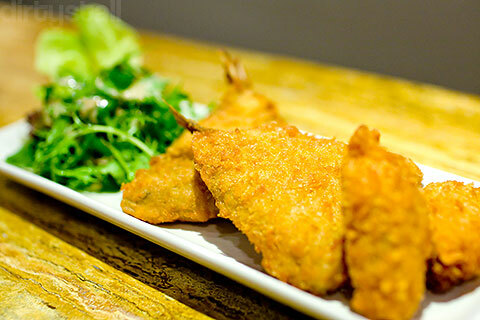 The ‘furai‘ part of the name is simply how the Japanese refer to such style of breaded deep-frying, and it’s also the way they say ‘fry’. However if the ingredient being fried is beef/pork/chicken, they will use the term ‘katsu‘ instead. Hence ebi furai but ton katsu! Haha this was a big surprise when Roy served it to me. He said that I’d eaten too much Japanese food at the SSB so he wanted to refresh my tastes and give me a twist on the food he normally serves. It was done perfectly, the steak was medium-rare and tender to chew on. 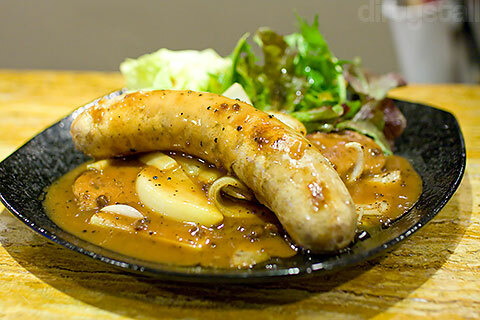 Bratwurst was great also but nothing special. The highlight was the sauce which he said was made from scratch and it tasted really really good. 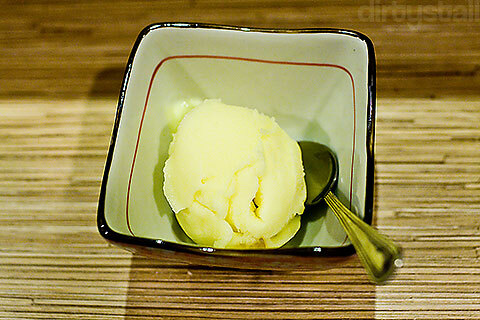 Probably lots of butter cubes were murdered to make it! Shake, mekajiki, shiro-maguro, hotate, aji. Thick luscious slabs on little nodes of rice = sushi delight! 4 Responses to "The omakase with the white tuna"
Do you know shiro maguro makes you ls? That is why I always reject them in Japanese restaurants haha.